As I mentioned in my Happy New year post – my sisters and I have been working on a Family Cookbook Scrapbook for two years. It started as a gift from me to my sister, Roberta, in Atlanta. 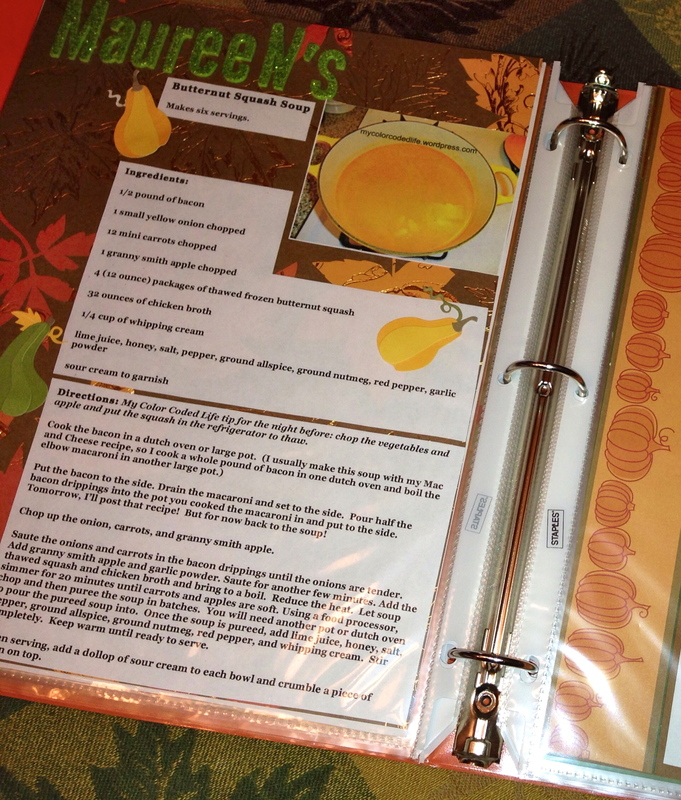 She loves pumpkins, so I gathered a bunch of pumpkin recipes and scrapbooked them into a binder for her. 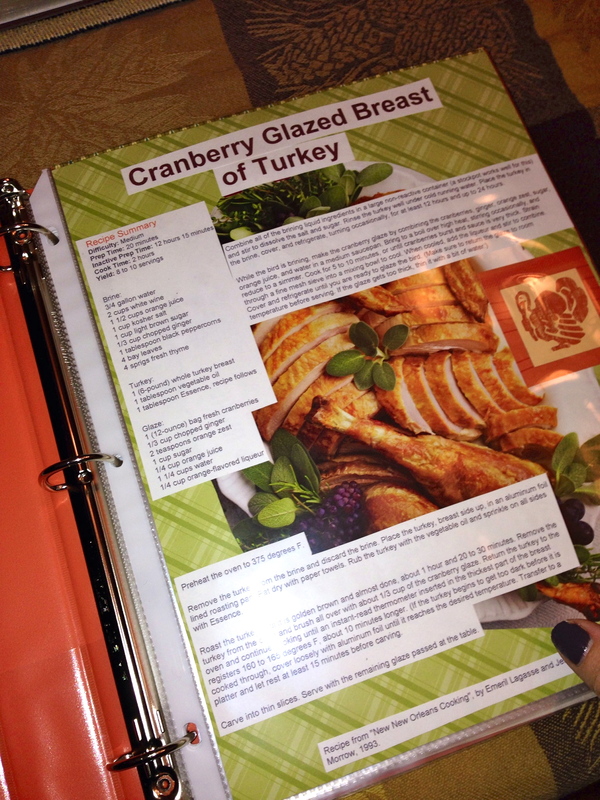 I gave it to her at Thanksgiving 2012 and we decided to keep adding to the binder all of the Fall / Pumpkin / Thanksgiving recipes from all different family members. Even though this is a work in progress, we took what we had done and made color copies for all of our family members. This was a great Christmas present! We know we still have many family members to get recipes from, but now that they can see the compiled results – we hope it will inspire them to give us more recipes! I will plan on sharing a recipe from our Family Cookbook once a week. Above is the page for my Butternut Squash Soup recipe which I have shared here: Butternut Squash Soup. 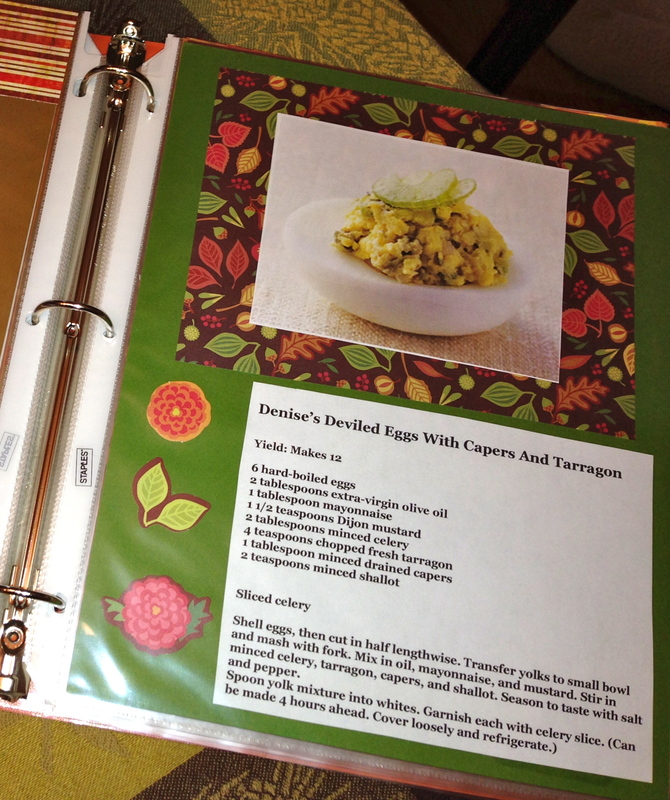 For the first installment, I will share one my sister Denise’s favorite recipes – Deviled Egg with Capers and Tarragon. She got this recipe from epicurious.com who credits Kristine Kidd as the creator. Below is the scrapbooked page and the complete recipe. Shell eggs, then cut in half lengthwise. Transfer yolks to small bowl and mash with fork. Mix in oil, mayonnaise, and mustard. Stir in minced celery, tarragon, capers, and shallot. Season to taste with salt and pepper. Spoon yolk mixture into whites. Garnish each with celery slice. My mom did a cookbook/binder full of all our family recipes for my brother and I many Christmases ago. I still use mine all the time. She photocopied all the cards so my grandmother’s (and other family members’) handwritten notes are still on the recipes. I love it! Including handwritten recipes is such a great idea, Jessi. I know we have some from my mom. I woudl love to see your family cookbook one day! Maureen, Good idea to share here! I’ve been gathering some Minnesota Wild Rice recipes to add to next year’s Thanksgiving dinner and book! I also have hand written cards from Jeanne (my late mother-in-law) and promise find a few for next year! Can’t wait to add all these to our binder Diane!